The Asia Pacific region is a major player in Foreign Direct Investment (FDI), accounting for 31% of global FDI inflows in 2016. Increasingly International Investment Agreements (IIAs) are being put in place to manage and control these investment flows. According to UNCTAD, as of May 2016, more than 2,700 IIAs have entered into force, with more than half, or 1,160, having been signed by one or more parties from the Asia-Pacific region. With the increasing attention on high-technology industries and knowledge economies, science, technology and innovation (STI) related provisions are increasingly included in IIAs and other relevant trade/investment agreements. This paper examines the current landscape of IIAs regarding STI in the Asia-Pacific region. 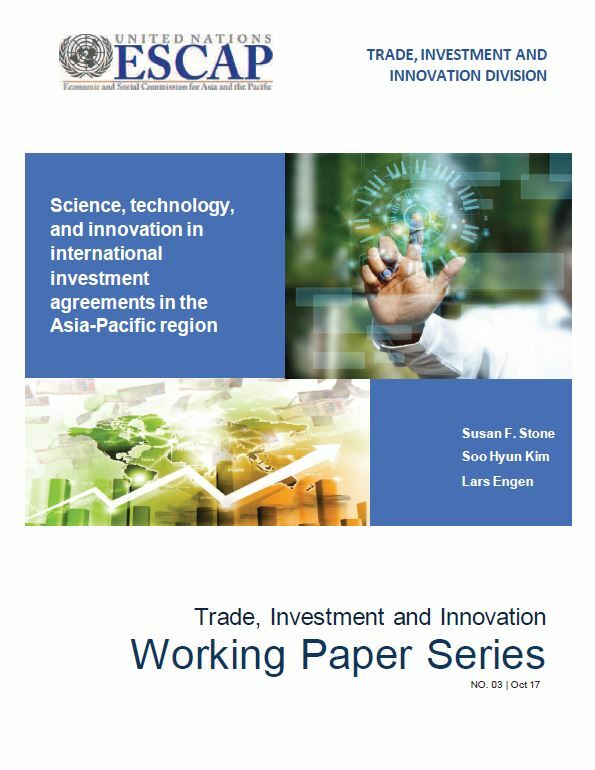 The paper examines the degree to which STI related provisions are included in IIAs, and provides further analysis of STI-related provisions by categorization based on common themes, such as technological and technical cooperation, information technology, clean technology, and Intellectual Property Rights (IPR), separately for bilateral investment treaties (BITs) and regional trade agreements (RTAs). The paper concludes by suggesting areas for future research.